Many people in our society will one day get married and have kids. But what is it like getting married and raising a family while working in the animation industry? Is that even possible? The short answer is – yes! And today on the show we’re pleased to feature Cassie Soliday, Script Coordinator at Wild Canary, and Katya Bowser, Storyboard Artist at Wild Canary, to discuss how they’ve navigated the relationship waters with their husbands and families while also pursuing their careers. And in part two of our podcast, Cassie and Katya explain the TV animation production pipeline and why it’s important to understand the process and your place in it. And make sure to check out The Ink And Paint Girls Podcast, where they are currently featuring a miniseries all about marriage and family! So you want to work in animation in Los Angeles, but you live outside of California. How do you get here? How much should you save? How do you find a place to live? And once you get here, how do you get a foothold in the industry and advertise your work online and in person? Black ‘N Animated Podcast hosts and animation professionals Breana Williams and Waymond Singleton join us for part 2 of our animated life miniseries to share how they got into the industry, networking tips and showcasing your work via social media! By Angela Entzminger November 13, 2018 November 13, 2018 2D Animation, 2D Animator, 3D Animation, animation, Animator, Warner Bros. Animator Crystal Stromer returns to discuss working as an animation director for Teen Titans Go! To The Movies. Crystal discusses how she became an animation director on the film, working alongside the talented crew, some of her favorite jokes from the movie, watching the movie with test audiences, and more! Join us as we discuss one of this summer’s funniest films. In part II of our interview with Jack Kasprzak, Jack shares his experiences working on DreamWorks TV’s Spirit Riding Free and the importance of great communication in order to work well on a production. We also discuss his work with the SketchZone Podcast (on iTunes, check it out! ), advice he would give his younger self, and more! Ep. 082: Bonus Episode – News, Events and Spooky Shows! Hello everyone! It’s Halloween Eve (that’s a thing!) 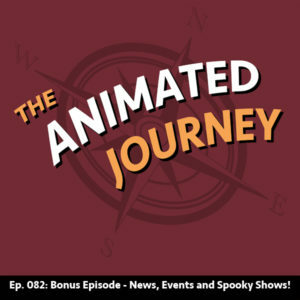 and there were so many news stories in the world of animation that we created a bonus episode to talk about it. We discuss Ed Catmull retiring from Pixar, the Animation Guild’s new agreements, the controversy surrounding Red Dead Redemption 2, events in SoCal, a scary What We’ve Been Watching segment and more! Check it out and make sure to subscribe on iTunes, Stitcher, Google Play and Spotify. And tune in next week when we bring you part 2 of Jack Kasprzak’s interview. You won’t want to miss it! Jack Kasprzak is no stranger to the world of animation. After graduating from art school and working for nearly 10 years as a VFX artist for Digital Domain on such films as X-Men: Days of Future Past, 2012, TRON:Legacy, Transformers: Dark of the Moon, Ender’s Game, My Super Ex-Girlfriend, and many more, he made the leap to becoming an animation director on DreamWorks TV’s Spirit Riding Free. In part one of our interview Jack shares his love of making films at a young age with his family and friends, the joys and trials of working in the VFX industry, creating his own personal art, pitching ideas with his business partner and more!